News | The ARCO™ Series: Where AV, Simplicity and Design Merge | Marshall Furniture, Inc. | Total Video Products Inc.
Easy-to-specify, stylish and affordable, Marshall Furniture’s ARCO™ products set a new standard for AV furniture. Marshall Furniture’s new ARCO™ product line is a refreshing and innovative approach to AV furniture. The products in this new style series are not only versatile and affordable but also purposefully simple in design. The two main elements of this style are the body and the attached architectural paneling. The body provides a framework for equipment while the panels add a stylistic element to the piece. 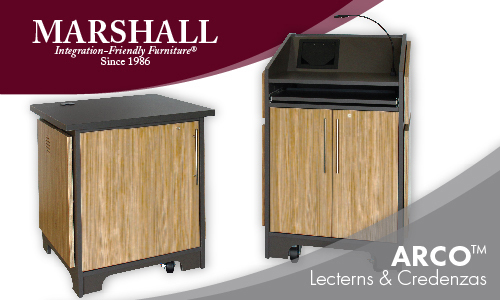 The ARCO™ line consists primarily of lecterns in two sizes and one, two or three bay credenzas. Because everything has been predetermined and pre-engineered, ARCO™ products are budget-friendly and make the specification process a breeze. The ARCO™ product line streamlines the customization process for both integrators and designers to satisfy both ends of the spectrum. For integrators, the pre-engineered body can ship separately within 5 business days, so equipment can be loaded and tested right away for projects with a tight deadline. For architects and interior designers, the attached paneling comes in several materials and finishes to ensure each piece seamlessly blends with the aesthetic of its respective space. Paneling is available in any of our 23 stock wood veneer finishes, 13 stock melamine colors, any commercially available plastic laminate or any commercially available paint color. Panels can also be custom color matched to room architecture or other furniture in the space. Wood, laminate and paint grade panels ship in 4-6 weeks while melamine ships in 10 business days. Each piece comes with a set of standard features that satisfy the majority of customer concerns. This includes standard locking doors, locking service panel(s), casters, ventilation, floor cord pass and a notched base for air intake and cable clearance. From there, users are presented with a clear-cut list of internal configurations, door upgrades and optional add-ons. Specifying an ARCO™ product is an easy step-by-step process. First, pick from a 25” or 32” wide lectern or a one, two or three bay credenza. Second, choose either Slate Gray or Black melamine for the body and wood, melamine, laminate or paint for the architectural paneling. Third, decide on an internal configuration and door style. For lecterns, up to six internal configurations are available that variously combine a keyboard shelf, adjustable shelf, storage space and fixed rack. Credenzas include your choice of rack or shelving. Doors can be upgraded from standard locking to vented or glass inlay ones instead. Lastly, choose some add-ons to complete and individualize your piece. For lecterns, available options include one or two side shelves, cooling fan(s), cable reservoir, gooseneck light, small surface cut outs for equipment or a custom logo. For credenzas, specify fans to alleviate heat concerns or AC-USB outlets for power. Choosing a furniture solution is never easy, especially when the customization possibilities are endless. Furthermore, the disconnect that exists between architecture and AV can sometimes result in miscommunications or an unsatisfactory design. The uncomplicated nature of the ARCO™ series not only address these common concerns but also presents customers familiar with Marshall Furniture products with a new, unique furniture solution. All ARCO™ units are covered by a 10-year warranty and are built with the same expert level of craftmanship and attention to detail as custom Marshall Furniture pieces. For more information, please contact the sales team to speak with one of our knowledgeable designers.